UPDATE (10/31/18): A second memorial service for Dennis in Pahrump has been scheduled. It will be held on Friday, November 16, 2018 at 6:00 pm at the Pahrump Nugget. This service will be open to the public and the media. 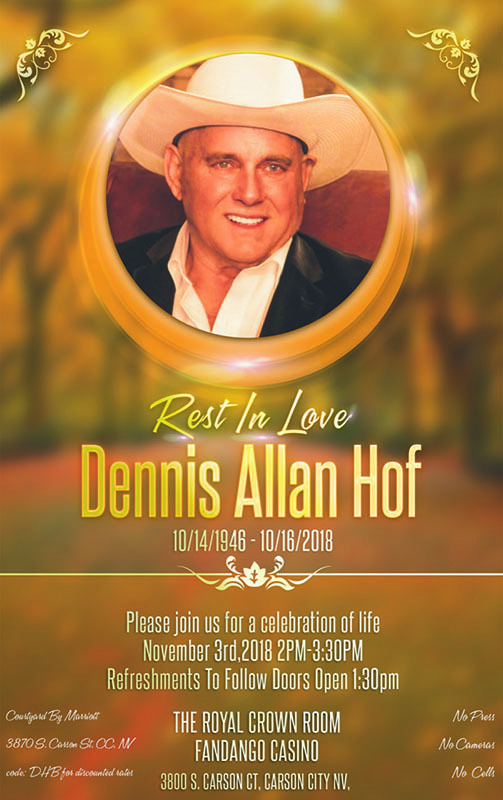 UPDATE (10/29/18): Because seating at Dennis’ “Celebration of Life” service in Carson City is open to the public but limited, folks wishing to attend need to RSVP through Eventbrite. There will be some “standing room only” availability on the day of the service on a first-come basis for those who do not pre-register. UPDATE (10/25/18): Yes, Dennis’ memorial service will be open to the public. However, seating will be very limited. So this will be a ticketed event. Check back here regularly for information on obtaining a ticket as soon as the online reservation system is in place. The community has lost a great and generous man. Dennis was a wonderful boss to me. He kept me around for about 20 years even when the economy took a turn, and for that I was always grateful. I was always amazed at his patience. When I did things wrong, he would always take his time, methodically explaining how to do each thing correctly, even when I sprayed his favorite portrait with champagne. I’m glad he got to enjoy his last days on Earth with the wonderful party that he had, and with family and friends. You will always be in my heart. The GOP just next 2 my wife’s doctor’s office and one day I went in and that’s where I’m at mr. Hoffs son and talked to be campaign manager before I continue you have to understand I’m a long life Democrat !!! When our conversation was over and it had to be (because my wife was done with the doctors and was yelling at me to let’s go)I was going to vote for Mr Hof I was convinced of what he believed in and what he stood for !!!! I’m very sorry for the family’s loss and for the GOP loss I KNOW HE WOULD HAVE WON REMEMBER THIS IS COMING FROM A DEMOCRAT¡!!!! Dennis , Was a great man !!! Dennis was a friend to all who knew him. He was generous to charity and to the Republican Party. He made prostitution respectable and loved liberty. He won the Republican Primary because of his beliefs and honesty. He was a mover and shaker to the political world. There aren’t enough words to explain how honored I am to have known the man and to have witnessed the love he showered to everyone near him. I went to your last birthday bash after you passed over and quietly wished you all the joys heaven will bring you. I’m Shocked and Saddened that Mr Hof has passed away. I had met him at the Bunnyranch just this past Sept and he signed a copy of his autobiography for me and talked a bit. He was very kind and gracious.Nevada has almost a true Champion. I’ve worked with Dennis Hof for almost 20 years. What he helped me do with my life and the goals we had for me are nothing short of miracles. He never lost faith in me. All he ever wanted for us is to walk his walk; never in such epic proportions as his, but in each of our own individual ways. Be The best we could be, achieve our dreams, be nice & help others & just be happy & have fun. He left a void no other man can fill. I truly believe that. I will miss him. We will all miss him & honor his legacy til the day we see him again on the other side. Dennis never lived for himself. He could of easily lived on an exotic island somewhere, but he did not. He lived meagerly and on property, close to us, where he could be, in most cases, the only man we could rely on to help us, congratulate us, encourage us, fight for us & console us. He got into politics to help even more people. God bless you Dennis Hof. God bless all the lives he touched and all those he intended to help too. I am saddened by the death of Dennis Hof I was his assistance in San Diego in the 90’s. I never met anybody that could fill his shoes he was kind hearted. Anybody that knew Dennis and was in his circled were always well taken care of, He loved the finer things in life, He was a true Boss Man, The one advice he told he told one time The best revenge to your enemy is Success! He taught me alot great values of life and business he will most definitely be missed never forgotten RIP Dennis. Thank you for the memories and smiles for miles.. Thank you for making such an impact in literally thousands of people’s life. We truly lost a huge piece of Nevafae soul and a huge part of CARDON CITYS HEART!!!! Dennis Hoff was blessed in life because he was so generous to others in need. He was a generous supporter of the animal shelter in pahrump, and to the wild horses he took care of on his property. He was loved by everyone he met and deserved their respect as a serious politician. He ran for Assembly District 36 in Nevada because believed in the Republican Values of the rural lifestyle. God Rest your soul. You are missed. What a tragic loss of such a kind, smart, savy business man. I am so disappointed; not being able to see what he could of done for our wild west state. He was a “real person” and is sadly missed.I only pray someone half as good will be chosen to hold his seat. Someone he would hand pick; not a phony rhino. I regret not meeting you while you were still with us. I wanted to have a drink with you and one of your working ladies at the Moonlite Bunny Ranch that I follow on Twitter. I would have voted for you if I was a resident of the district you were running in. RIP to a true Nevadan from another true Nevadan who loves the Silver State just as much as you do. Save a bar seat for me in the afterlife.